Buffeted by gale-force winds, Henry Klutho drove this new 1908 model car down the deserted streets of Jacksonville at 3:00 in the morning. A fierce hurricane had just hit the city and the young architect could not stand the suspense. Only a few days earlier, workers had topped out his latest building at ten stories. TEN STORIES! Although Klutho had assured the city fathers that a building of such a extraordinary height would be safe, even he must have had enough uncertainties that he was risking his shiny new car in the midst of the storm to see if it was still standing. This portrait of Klutho accompanied a four-page biographical sketch in A.B. 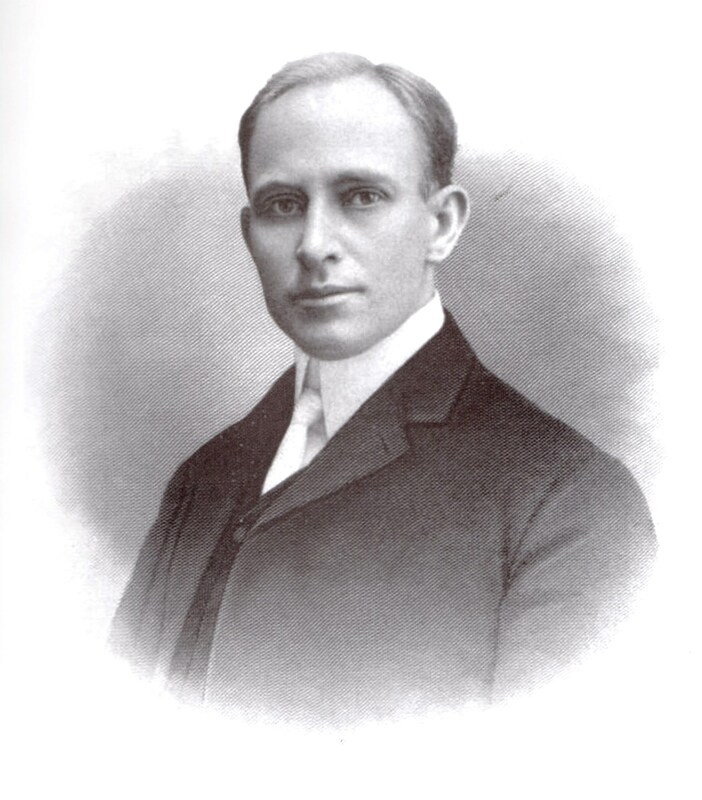 Caldwell’s “The Makers of America, Florida Edition” in 1909. For months, the town had been talking about the Bisbee Building as it slowly rose above the city’s skyline. 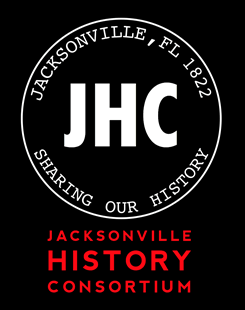 Not only was it Jacksonville’s first skyscraper, but it was also the first reinforced-concrete frame high-rise building in the South, using revolutionary materials and construction techniques. As he stared upward through the driving rain that night, Klutho rejoiced to see that it was still there. Seven years earlier, the 28-year old architect had read about the destruction of downtown Jacksonville in the headlines of The New York Times. The Great Fire of 1901 had wiped out thousands of buildings in a single day, creating an empty slate for the talented young architect to help design a new city. Known locally as the “Laura Street Trio,” the Florida Life Building (left), the Marble Bank (foreground), and the Bisbee Building (right) are some of Jacksonville’s most significant–and endangered–buildings. Klutho’s fine artistic sense was matched by his sharp business acumen. Two months after the Great Fire, Klutho moved to Jacksonville from New York. He quickly made contacts with the towns mover and shakers and, within one month, he was designing the city’s largest building, the Dyal-Upchurch Building on Bay Street. Two months later, he had designed the new City Hall and the stately home of one of the governors of the Jacksonville Board of Trade. By the time the Bisbee skyscraper was completed in 1909, Klutho had already shaped the Jacksonville skyline more than any other person. And his best was yet to come. During a trip to New York around 1905, Klutho met Frank Lloyd Wright, generally recognized now as America’s greatest architect. From the turn of the century to World War I, Wright and a small group of gifted architects in and around Chicago championed a new philosophy of architecture that became known as “Prairie” style. This new architecture eschewed the classical columns and Roman arches of antiquity, instead embracing strong horizontal lines, flowing spaces, natural materials, broad expanses of windows, and a close relationship between a building and its environment. This bold architectural aesthetic, which sought to establish a truly America style rather than borrow from older European traditions, greatly appealed to Henry John Klutho’s creative mind. 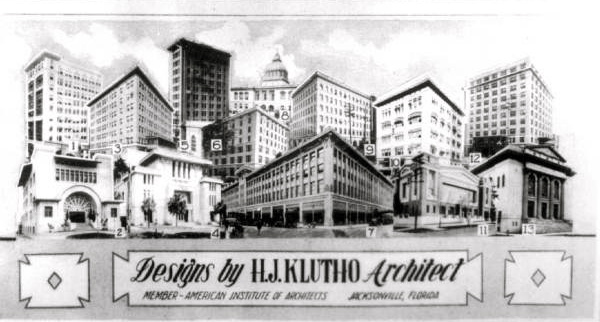 Un the years that followed his meeting Wright, Klutho began to depart from the more traditional, classical style of buildings he had first designed in Jacksonville. By 1908, he was fully committed to this modern architectural movement. By the close of World War I, there were more Prairie-style buildings in Jacksonville than in any other city ourside the Midwest. In an incredibly productive six-year period starting in 1907, Klutho not only garnered a large percentage of the major architectural commissions in downtown Jacksonvlle, but he also convinced his clients to go along with his radically modern designs. First was the seven-story YMCA Building at the corner of Laura and Duval Streets, framed entirely of reinforced concrete and featuring an indoor running track suspended over the gymnasium by cantilevered concrete beams. Then came the Seminole Hotel and the Morocco Temple and the Florida Life Building, all full-fledged statements of the Prairie style. He also embraced this style in the design of his own residence on Main Street, along with the Florence Court Apartments, the Claude Nolan Cadillac building and the Klutho Apartments, all in the Springfield neighborhood adjacent to downtown. But the grandest point in Klutho’s career – and the zenith of this city’s architecture – was marked by the completion of the St. James Building on October 21, 1921. Designed for Jacob and Morris Cohen as a department store and office building, this four-story structure covered the entire city block overlooking Hemming Park. It was the largest building in Jacksonville at that time and was the ninth-largest department store in the United States. Close up of the St. James Building. The building was Klutho’s Prairie School masterpiece, richly decorated with abstract terra cotta ornamentation and featuring a tour de force interior highlighted by a 75-foot octagonal glass dome and ornate open-cage elevators. Although badly remodeled and then vacant in later years, the St. James Building was beautifully renovated from 1995-1997 and opened as Jacksonville’s City Hall December 1997. The St. James is one of the city’s most monumental works of art. The legacy of Henry John Klutho lies not only in the buildings he left behind. He also was a nationally recognized visionary, an artist, an urban planner, a major force in Jacksonville’s movie industry, an inventor, a philosopher who voice often went unheard. His architectural work remains a part of one of America’s greatest architectural movements. When he died in 1964, at the age of 91, he was in near-poverty and was not widely recognized for his extraordinary contributions to his adopted city. In the years since Klutho’s death, over a dozen of his finest buildings have been demolished or mutilated beyond recognition. It was obvious to him during his lifetime that Jacksonville often had difficulty in recognizing its own potential for greatness. As Klutho once told a gathering of his colleagues, “In the land of the blind, a one-eyed man is king.” And he had no doubt who was the king.